The Global Volcanism Program has no activity reports for Jefferson. The Global Volcanism Program has no Weekly Reports available for Jefferson. The Global Volcanism Program has no Bulletin Reports available for Jefferson. 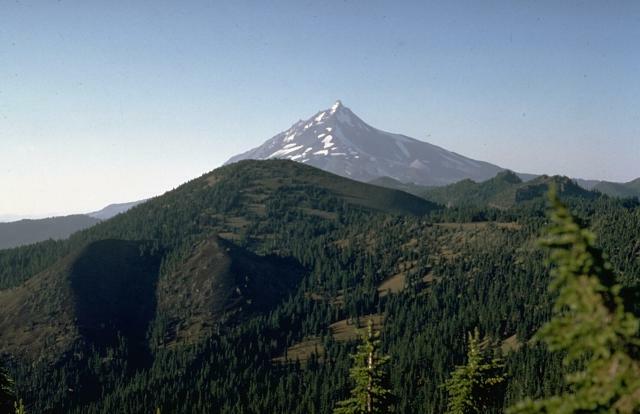 Mount Jefferson, Oregon's second highest peak, is a deeply eroded stratovolcano that has been inactive since the late Pleistocene. The glacier-clad landmark prominent from both sides of the Cascade Range was named by Lewis and Clark for the president that sponsored their expedition. Jefferson was constructed in two episodes interrupted by extensive glacial erosion. The first of these, beginning about 290,000 years ago, produced an andesitic-to-dacitic volcano possibly higher than the current summit. Dacitic lava domes were emplaced during the 2nd cycle beginning about 70,000 years ago that produced ash flows that traveled 15 km to the east and west. 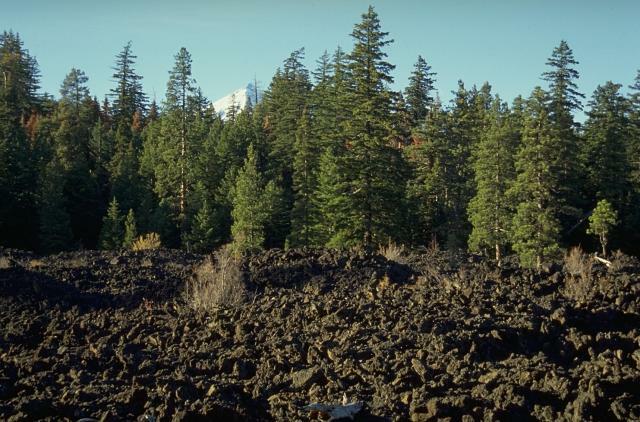 Several Holocene cinder cones near the Cascade crest south of Jefferson have produced lava flows that traveled down glacially carved valleys, including those from Forked Butte and North Cinder Peak. The most recent eruption, from a cinder cone on the flank of the South Cinder Peak cone, produced a lava flow that traveled west into Marion Lake about 1000 years ago. Greene R C, 1968. Petrography and petrology of volcanic rocks in the Mount Jefferson area, High Cascade Range, Oregon. U S Geol Surv Bull, 1251-G: 1-48. Harris S L, 1988. Fire Mountains of the West: the Cascade and Mono Lake Volcanoes. Missoula, MT: Mountain Press, 379 p.
Scott W E, 1977. Quaternary glaciation and volcanism, Metolius River area, Oregon. Geol Soc Amer Bull, 88: 113-124. Walker G W, Greene R C, Pattee E C, 1966. Mineral resources of the Mount Jefferson primitive area, Oregon. U S Geol Surv Bull, 1230-D: 1-32. There is no Deformation History data available for Jefferson. There is no Emissions History data available for Jefferson. The western slopes of Mount Jefferson rise above forested hills composed of older Pleistocene volcanic rocks. Cinder cones younger in age than the eroded main edifice of Mount Jefferson, which ceased activity during the late Pleistocene, are located to the south. Seen to the south from Ollalie Butte, sharp-peaked Mount Jefferson rises above a sea of clouds. The Three Sisters and Broken Top volcano appear on the horizon to the left. Youthful-looking volcanic cones north of Jefferson are, like Jefferson, late Pleistocene in age, but younger cones are found south of Jefferson. Morning alpenglow colors the glaciers of Mount Jefferson, reflected in the waters of Breitenbush Lake north of the volcano. The glacially eroded volcano has not erupted since the late Pleistocene, although flank vents to the south have been active as recently as about 1000 years ago. Mount Jefferson, a prominent landmark of the central Oregon Cascades, rises above deep canyons cut into thick lava flows of the Columbia River Basalt formation NE of the volcano. 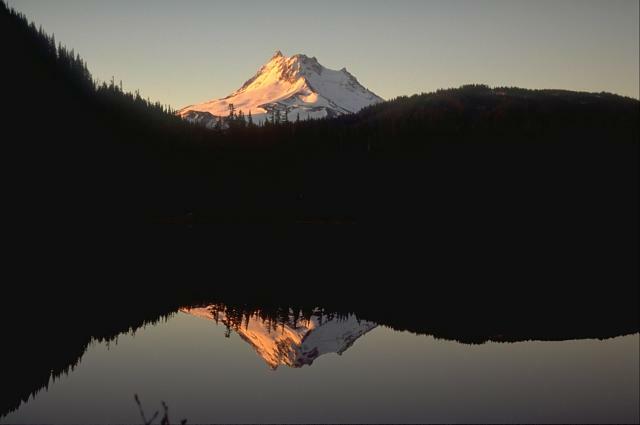 Mount Jefferson was named after the current president when it was observed by Lewis and Clark from the mouth of the Willamette River in 1804. Photo by Richard Waitt, 1984 (U.S. Geological Survey). 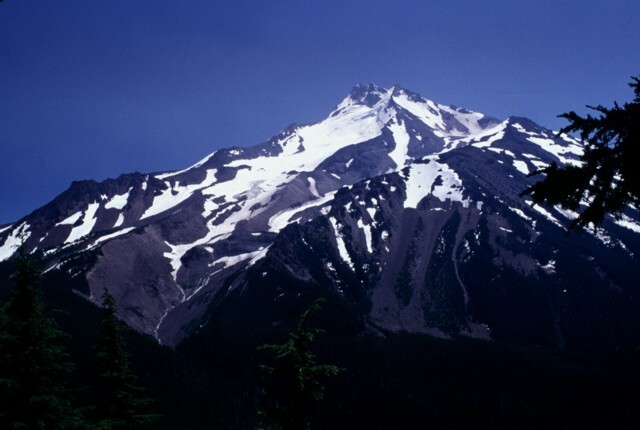 Volcanic activity at glacially eroded Mount Jefferson, Oregon's second highest peak, ended during the Pleistocene. However, cinder cones south of the volcano have been active as recently as about a thousand years ago. The extensive Whitewater Glacier in the foreground has eroded deeply into the volcano and blankets the east flank of Jefferson. Photo by Willie Scott, 1981 (U.S. Geological Survey). 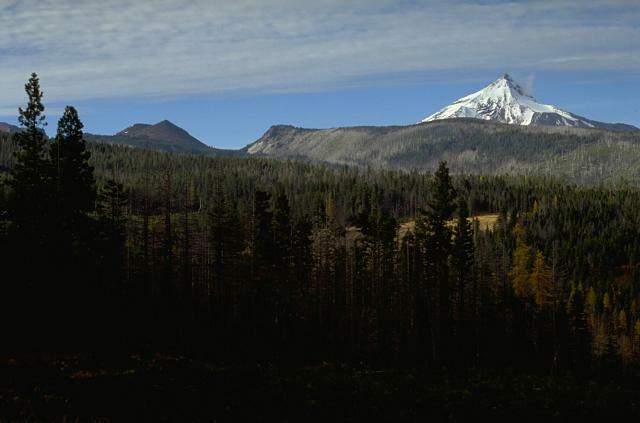 Mount Jefferson in the center and Mount Hood at the right, seen from Broken Top volcano to the south, are the two highest peaks in Oregon, towering above lower volcanic peaks of the High Cascades, such as Black Butte in the left foreground. 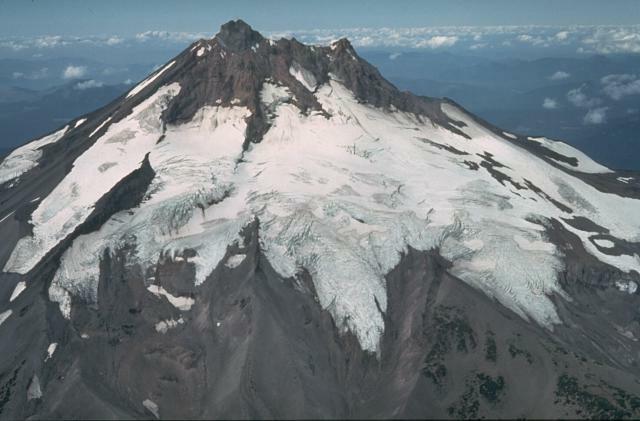 Mount Hood has been active in historical time and Mount Jefferson has Holocene cinder cones to its south although it has not erupted since the late Pleistocene. The unnamed cinder cone at the lower right, viewed from Bear Butte to the NW, was the source of a 13-km-long lava flow that traveled to the west down Jefferson Creek in the center of the photo. The lava flow overlies the northern lobe of a 6500-year-old flow from Forked Butte, another Holocene cinder cone south of Mount Jefferson. 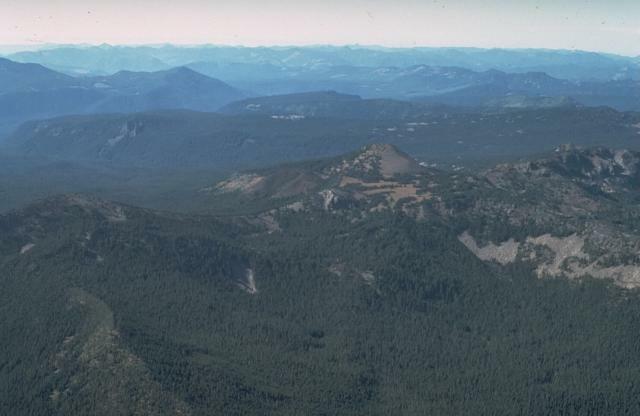 The Forked Butte lava flow divided into lobes that traveled on either side of Sugar Pine Ridge in the background. Photo by Willie Scott, 1972 (U.S. Geological Survey). The blocky Jefferson Creek lava flow in the foreground, which traveled 13 km down Jefferson and Candle Creeks from a unnamed cinder cone NE of Forked Butte, is younger than the nearby 6500-year-old Forked Butte lava flow. The two flows traveled down different drainages to join near this point. The snow-covered tip of Mount Jefferson is visible above the trees just left of center. Forked Butte, the cinder cone on the left skyline south of snow-capped Mount Jefferson, was formed about 6500 years ago. 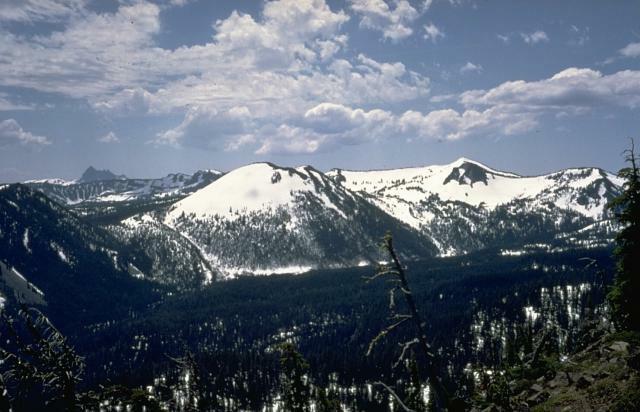 It produced blocky lava that flowed from the notch to the right of Forked Butte down valleys on both sides of Sugar Pine Ridge, which forms the right skyline. The southern lobe traveled 8 km to the west down Cabot Creek below Sugar Pine Ridge. 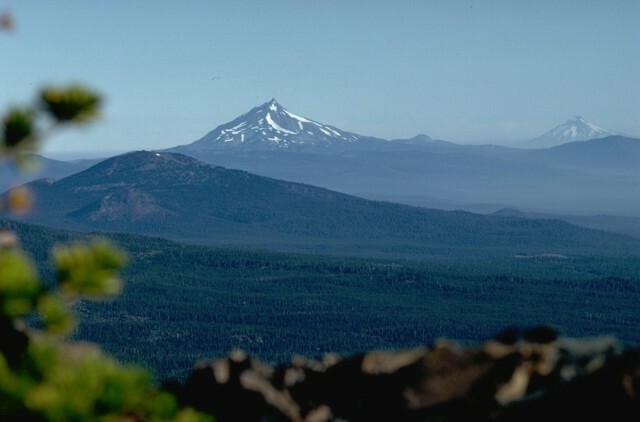 Forked Butte, viewed here from the SW, is a Holocene cinder cone south of Mount Jefferson that produced an 8-km-long lava flow down Cabot Creek about 6500 years ago. Forked Butte is one of three cinder cones south of Jefferson that have produced Holocene lava flows. Photo by Willie Scott, 1973 (U.S. Geological Survey). Forked Butte cinder cone in the foreground was formed about 6500 years ago south of Mount Jefferson, whose slopes appear at the right. A lava flow from the southern base of Forked Butte traveled 8 km to the west down Cabot Creek. Snow-covered Forked Butte cinder cone in the center of the photo rises above the valley floor across from Bear Butte on the NE. 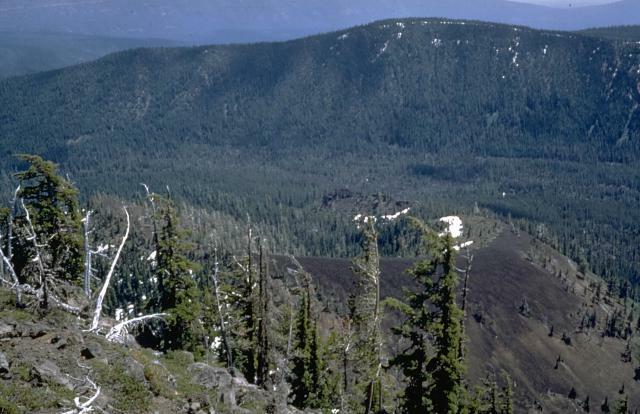 A lava flow that was erupted about 6500 years ago can be seen descending the left flank of the cone, one of two lobes that split around either side of Sugar Pine Ridge at the extreme left. 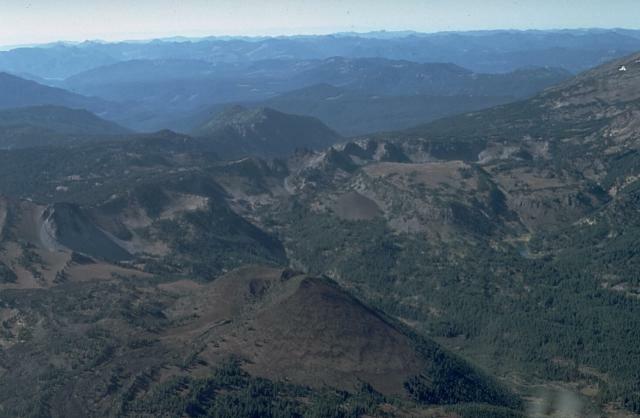 The latest eruption in the Mount Jefferson area occurred from the cinder cone at the lower left on the flank of South Cinder Peak in the center of the photo. The eruption, dated about 1000 years ago, formed the cinder cone and produced a lava flow that split into two lobes. One traveled to the NW, and the other flowed 3.5 km west into Marion Lake. 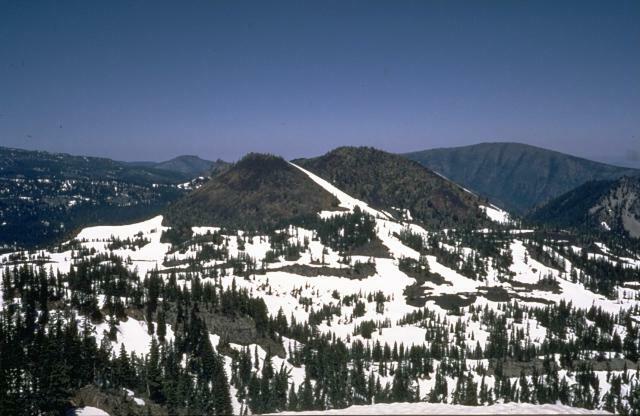 South Cinder Peak, the unvegetated cinder cone in the right center of the photo, is the youngest volcanic feature in the Mount Jefferson area. A smaller cinder cone seen at the left on its south flank in this view from the SE, formed about 1000 years ago and produced a lava flow that traveled to the west. 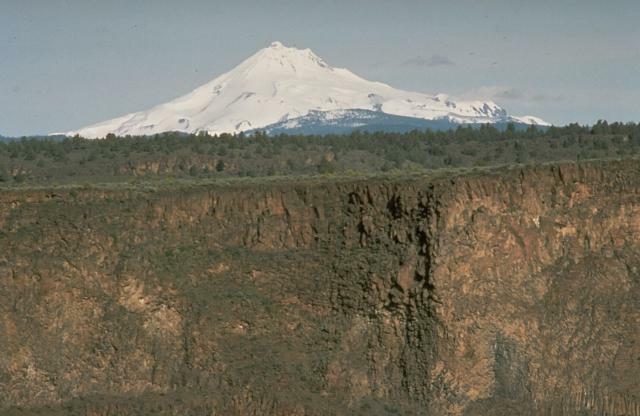 The young lava flow in the foreground, with snow-capped Mount Jefferson in the background, was erupted about 2600-2900 years ago from Yapoah cinder cone on the north flank of North Sister volcano. 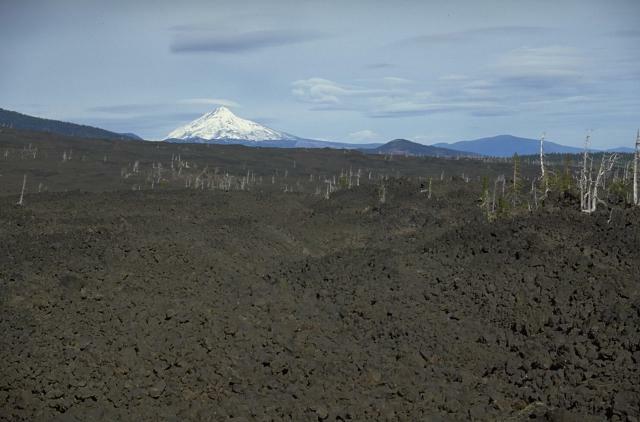 Lava flows in the middle of the photo originated from Little Belknap shield volcano, part of one of the largest concentrations of youthful volcanism in the continental United States: the McKenzie Pass area of the central Oregon Cascade Range. 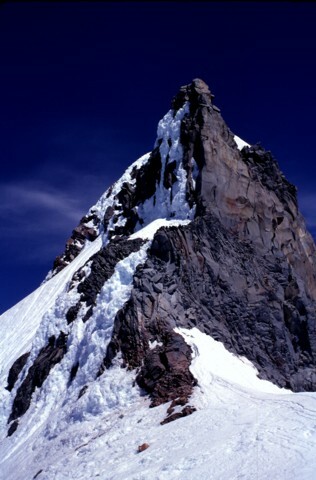 The steep-sided summit pinnacle of Mount Jefferson, seen here from the south, is one of the most dramatic summits of a Cascade Range volcano. 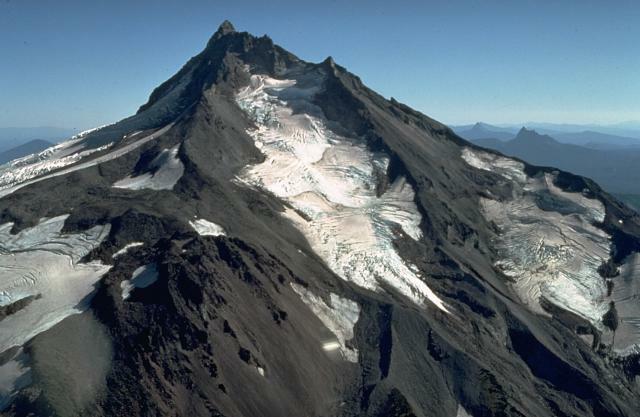 Mount Jefferson has been inactive since the late Pleistocene, allowing glacial erosion to remove the fragmental rocks of the original summit crater, exposing the more resistant rocks that cooled slowly in the central conduit. Deep glacial valleys cut the western flanks of Mount Jefferson volcano. An original andesitic-dacitic volcano that was at one time perhaps higher than the current volcano was extensively eroded by glaciers prior to formation of a younger dacitic volcano on top of the older edifice. Several dacitic lava domes, accompanied by major ash eruptions and pyroclastic flows, were associated with the younger volcano, which ceased activity during the late Pleistocene. 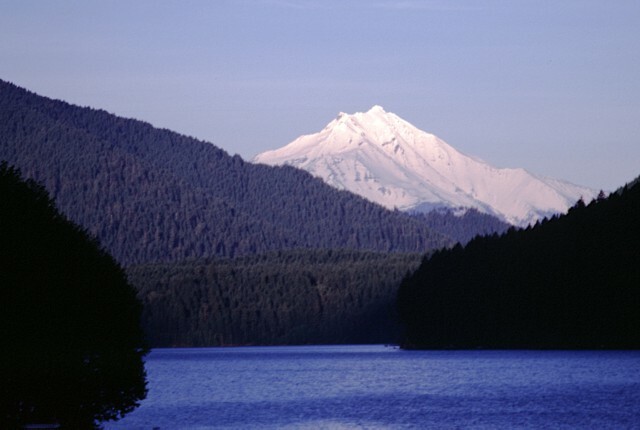 Snow-capped Mount Jefferson, Oregon's second highest peak, rises above Detroit Lake, a hydroelectric reservoir NW of the volcano. 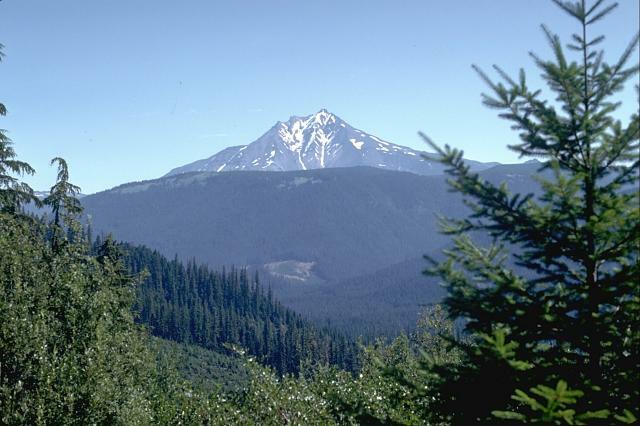 The Mount Jefferson region is a popular recreational area in the central Cascades and is the centerpiece of the Mount Jefferson Wilderness Area. 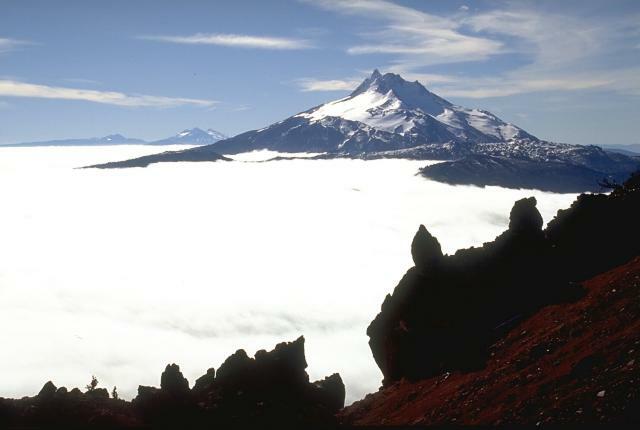 The Pacific Crest National Trail transects about 40 miles of the wilderness area, and Mount Jefferson itself is one of the more challenging climbs of Cascades volcanoes. There are no samples for Jefferson in the Smithsonian's NMNH Department of Mineral Sciences Rock and Ore collection. Large Eruptions of Jefferson Information about large Quaternary eruptions (VEI >= 4) is cataloged in the Large Magnitude Explosive Volcanic Eruptions (LaMEVE) database of the Volcano Global Risk Identification and Analysis Project (VOGRIPA).